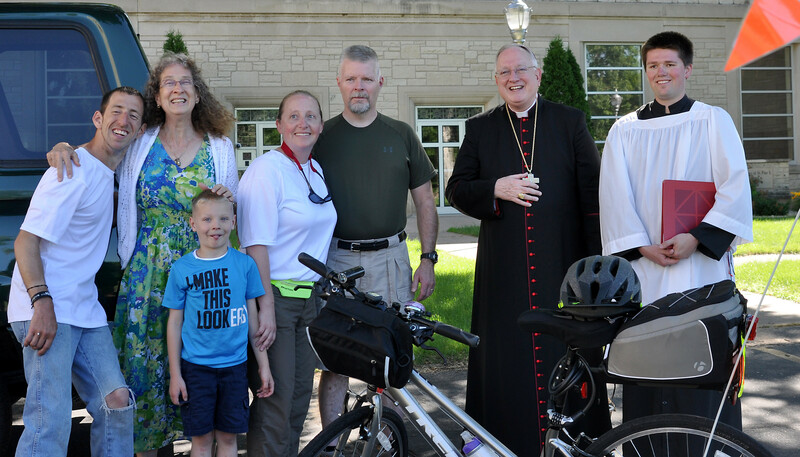 Bishop Callahan gives his blessing to the bikers and their bikes before they depart for the Shrine of Our Lady of Good Help in Champion. Terry Stott and Christopher Pundzak are leading a charge and standing up for the sanctity of marriage, and all from their bicycles. 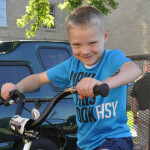 On June 21, 2016, the vigil of the feast day of Saints Thomas More and John Fisher, pilgrims on bicycles began their 200 mile journey from the Holy Cross Diocesan Center in La Crosse. 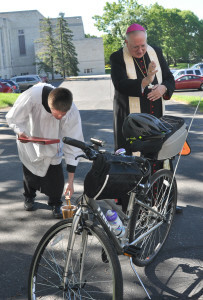 Carrying family photographs and prayer intentions, the pilgrims will bike across the state, giving prayerful witness to the sanctity of Marriage as a sacred union between one man and one woman. Upon arriving at the Shrine of Our Lady of Good Help in Champion, Wisconsin, it is their hope that these families and prayers may be presented to Our Lord (through the Immaculate Heart of our Beloved Mother, Mary) at a Mass celebrated on the 1-year anniversary of the Supreme Court ruling on marriage (June 26, 2016). To find out more about their cause and to follow their journey go to their website http://bike4marriage.com/ and join their Facebook group.